In the spring of 1826, Thomas Cole met Robert Gilmor Jr., a highly knowledgeable and sophisticated Baltimore collector, who soon commissioned a view of Catskill Mountain House, a popular hotel overlooking the Hudson River Valley. After a summer spent sketching and painting in the area and corresponding with his patron concerning the selection of a new subject, Cole completed Sunrise in the Catskills in early December and had it delivered to Baltimore on Christmas Day. According to the artist, the painting shows sunrise from Vly Mountain, a peak near the eastern headwaters of the Delaware River. Cole chose a daringly elevated vantage point for the work, one where the viewer is poised looking out at several other mountains and at valleys filled with mist shining in the morning light. The foreground is filled with tangled bits of underbrush, contorted and fallen trees, and rough outcroppings of rock precariously situated at the slope's edge. This is not a tamed and cultivated portion of the American landscape but a remote, wild area with no evidence of human presence. Upon receiving the picture, Gilmor wrote immediately to Cole: "It is extremely well painted, with great truth of nature. I have seen a thousand such scenes when in the mountains, and though the task was a very difficult one, yet you have perfectly succeeded in rendering the mists of the valley rising as the sun began to peep over the summits of the mountains." 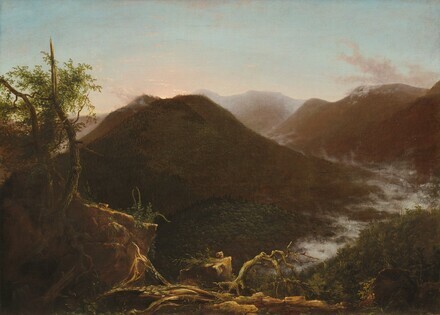 As Cole's first fully expressed wilderness painting and a document of his relationship to his important early patron, Sunrise in the Catskills is a pivotal work in the story of 19th-century American landscape painting, containing the seeds of Cole's later masterpieces and anticipating the great wilderness pictures of his pupil Frederic Edwin Church in the 1850s and 1860s. Commissioned 1826 by Robert Gilmor, Jr. [1774-1848], Baltimore; his estate; (sale, Leonard & Cunningham, Boston, 24 April 1850, no. 39). Robert Hall, Hamden, Connecticut, until 1968; (Kennedy Galleries, New York); purchased 1968 by Mr. and Mrs. John D. Rockefeller, III, New York; gift 1989 to NGA. The commission is documented in a series of letters between Cole and Gilmor during July-December 1826 (Dreer Collection of American Artists, Historical Society of Pennsylvania; and New York State Library, Albany); these are printed in Howard S. Merritt, "Correspondence Between Thomas Cole and Robert Gilmor, Jr." (in Baltimore Museum of Art, Annual II: Studies on Thomas Cole, an American Romanticist, Baltimore, 1967: 43-50). On Robert Gilmor and his collection, see Anna Wells Rutledge, "One Early American's Precocious Taste," Art News 48 (March 1949): 28-29, 51; Anna Wells Rutledge, "Robert Gilmor, Jr., Baltimore Collector," Journal of the Walters Art Gallery 12 (1949): 18-39; Barbara Novak, "Thomas Cole and Robert Gilmor," Art Quarterly 25 (Spring 1962): 41-53; and The Taste of Maryland: Art Collecting in Maryland, Exh. cat. Walters Art Gallery, Baltimore, 1984: 1-7. Gilmor's will (14 December 1848, Baltimore City Register of Wills) does not mention Sunrise in the Catskills specifically and indicates that the distribution of his pictures was left up to his widow. The painting's appearance in this sale was kindly brought to the Gallery's attention by Lance Humphries (e-mail to Franklin Kelly, 12 March 2008, in NGA curatorial files). Humphries suggests that one of Gilmor's heirs, possibly his nephew Robert III, who attended Harvard University, was responsible for sending the painting to Boston for sale. The painting was sold with the artist's original letter of 4 December 1826 to Gilmor, Jr.
 Jules D. Prown (letter of 12 June 1991 in NGA curatorial files) states: "The painting came to my attention in February/March of 1968 when I was Curator of American Art in the Yale Art Gallery. It was then owned by Mr. Robert Hall . . . [of] Hamden, Connecticut." According to Prown, Hall indicated that he had received the painting from his father. Unfortunately, it has not been possible to trace this individual or to establish whether he was a Gilmor descendant. There are Gilmor descendants with the surname Hall, and at least two of them were named Robert. However, there is no evidence that either of these Robert Halls ever owned Sunrise in the Catskills or lived in Hamden. (Lance Humphries, who is researching a doctoral dissertation on Gilmor, assisted with this research.) In 1967, Merritt ("Correspondence," 46; see note 1 for full citation) listed Sunrise in the Catskills as being in a private collection in New Haven; however, in a letter of 25 April 1993 (in NGA curatorial files) Merritt indicated that although the telephone call came from New Haven, the owner may well have lived in Hamden. American Art: An Exhibition from the Collection of Mr. and Mrs. John D. Rockefeller 3rd, The Fine Arts Museums of San Francisco; Whitney Museum of American Art, New York, 1976, no. 33. Art for the Nation: Gifts in Honor of the 50th Anniversary of the National Gallery of Art, National Gallery of Art, Washington, D.C., 1991, 140-141, color repro. American Light: Selections from the National Gallery of Art, Art Museum of Western Virginia, Roanoke, May-August 1998, no cat. Treasures of Light: Paintings from the National Gallery of Art, Dixon Gallery and Gardens, Memphis, March-April 1998, no cat. Loan to display with permanent collection, Academy Art Museum, Easton, Maryland, 2007, no cat. The support is a medium-weight, plain-weave fabric that has been lined. Over a thin reddish brown ground, the paint was applied in fairly thin layers. In several areas, notably the sky and the background mountains, the ground shows through, contributing to the tonality. Areas of moderate impasto include the highlights of the trees and rocks and the brightly lit clouds in the sky. The overall paint surface is slightly abraded, especially in the sky, and the light colors have become more transparent with age, allowing the dark ground to show more prominently than was originally intended. Discolored varnish was removed and the painting was restored in 1990. Dunlap, William. A History of the Rise and Progress of The Arts of Design in the United States. 2 vols. Reprinted in 3. New York, 1969 (1834): 3:274. Merritt, Howard S. "Correspondence Between Thomas Cole and Robert Gilmour, Jr." In Baltimore Museum of Art. Annual II: Studies on Thomas Cole, an American Romanticist. Baltimore, 1967: 43-57, 128, repro. 46. Czestochowski, Joseph S. The American Landscape Tradition: A Study and Gallery of Paintings. New York, 1982: 64-65, color repro. Wolf, Bryan Jay. Romantic Re-vision: Culture and Consciousness in Nineteenth-Century American Painting and Literature. Chicago and London, 1982: 194, 198-210, repro. 199. Johnston, Sona K. American Paintings 1750-1900 from the Collection of the Baltimore Museum of Art. Baltimore, 1983: 153, n. 1. Parry, Ellwood C., III. "Thomas Cole's Early Career: 1818-1829." In Edward J. Nygren, Views and Visions: American Landscape before 1830. Exh. cat. Corcoran Gallery of Art, Washington, D.C., 1986: 173-174. Myers, Kenneth. The Catskills: Painters, Writers, and Tourists in the Mountains, 1820-1895. Exh. cat. Hudson River Museum, Yonkers, New York, 1987: 83-84, n. 59. Parry, Ellwood C., III. The Art of Thomas Cole: Ambition and Imagination. Newark, Delaware, 1988: 22, 43-45, pl. 2. Powell, Earl A., III. Thomas Cole. New York, 1990: 30, color pl., 32. Cikovsky, Nicolai, Jr., and Franklin Kelly. "Art for the Nation: The National Gallery Collects." Antiques 139 (March 1991): 568-573. Parry, Ellwood C., III. "Les Montagnes dans L'imaginaire de Thomas Cole." In La Montagne et Ses Images du Peintre d'Arkrésilas à Thomas Cole. Paris, 1991: 389-393, 399, color repro. (reversed), 414. American Paintings: An Illustrated Catalogue. National Gallery of Art, Washington, 1992: 144, repro. Kelly, Franklin. Thomas Cole's Paintings of Eden Exh. cat. Amon Carter Museum, Fort Worth, 1994: 19, repro. Kelly, Franklin, with Nicolai Cikovsky, Jr., Deborah Chotner, and John Davis. American Paintings of the Nineteenth Century, Part I. The Collections of the National Gallery of Art Systematic Catalogue. Washington, D.C., 1996: 76-81, color repro. Myers, Kenneth John. "Above the Clouds at Sunrise: Frederic Church's Memorial to Thomas Cole." In The Cultured Canvas: New Perspectives on American Landscape Painting edited by Nancy Siegel. Lebanon, N.H., 2012: 64.